The name lavender comes from the Latin lavare, "to wash," since it was often used in bath and laundry waters. Its calming and soothing properties make it unique. According to Nicholas Culpeper who wrote of the herb in 1653, lavender is especially of good use for problems of the head, colds, sluggishness, cramps, convulsions, weakness, and palsy. It strengthens the stomach and frees the liver and spleen from obstructions. It is also helpful in bringing about the menstrual flow. The flowers of lavender, steeped in a little alcohol, effectively promote the flow of urine, and help ease flatulence and colic. A decoration made with these flowers plus horehound, fennel, asparagus root, and cinnamon can help lightheadedness. Gargling with this as a mixture is good for toothache, and taking two spoonfuls internally can help with a lost voice. Lavender is recommended for any faintness or trembling of the emotional body, and can be applied to the temples or sniffed. It is not to be used where there is excessive blood or fever. Care should be taken with the oil drawn from lavender, usually called "oil of spike" because of its piercing potency. Lavender's tranquil properties make it an excellent mild sedative and painkiller, as well as in treating insect bites and small burns. 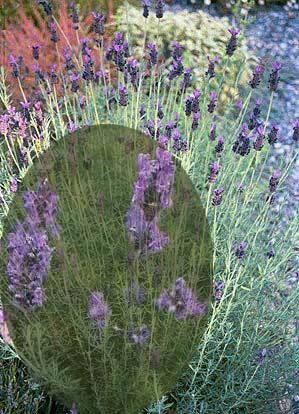 Blended for use as massage oil, lavender works wonders with skin problems, rheumatic aches, insomnia, and depression. It's easy to see why Mercury is said to rule this herb which is so helpful to the head and brain, for Mercury rules thinking and the mind. Author Izaak Walton once said, "I long to be in a house where the sheets smell of lavender." And it was Wang Wei, the eighth century Chinese writer, who said it best. "Look in the flowers and perfumes of nature for peace of mind and joy of life." A symbol of cleanliness and virginity, lavendar once was used medicinally for sunstroke. Included among the lavenders is a stunning bush of Lavandula heterophylla, a large plant that is almost continually in bloom. It has the sweetest smelling foliage, is equally good when dried, and is a stunning garden plant — but it must be wintered inside. This herb is reputed to be one of the plants most loved by the Virgin Mary, for as it does now, in ancient times it represented purity, cleanliness and virtue. Churches were decorated with lavender on Saint Barnabas Day. 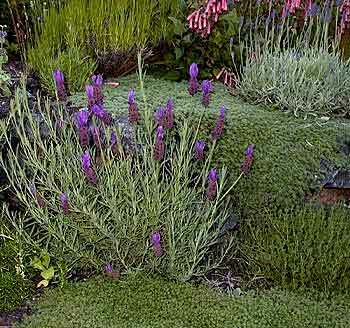 L. vera is the "true" lavender of which other lavenders are varieties. It is helpful for all disorders that trouble the head and spirit, for its scent is calming. For many centuries herbs have been used for medicine, cooking, decoration, and cosmetics. 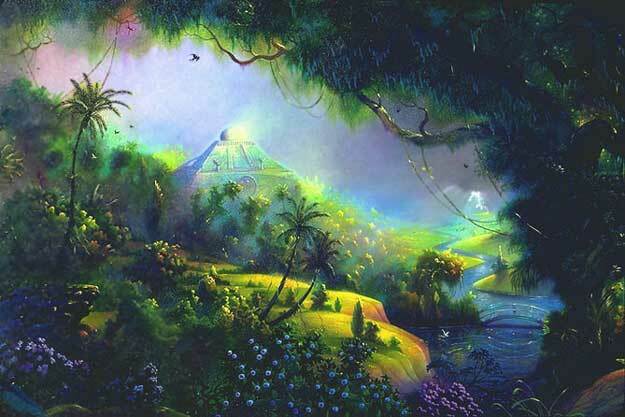 The ancient Egyptians even used aromatic oils for religious purposes. In medieval times, a scented handkerchief or nosegay was carried through the unsanitary streets of Europe to help ward off noxious smells. These herbal oils also helped prevent the spread of germs and viruses, since they are antiseptic and antibacterial, and in French hospital wards. they were burned often to fumigate them. One of the oldest and most revered is lavender, whose symbol is devotion. It generally flowers at the end of June and beginning of July. Decorative - The whole plant is good as hedging. Flower, hang dried in bunches on their own or with other tiny flowers, add sprigs to wreaths and nosegays. The leaves, stems, buds, and flowers of lavender all contain essential oils and all are valuable for different purposes. Parts of the plant can be used fresh, dried or distilled with the essential oil extracted. Culinary - Use to flavor jams and to make lavender vinegar. Mix small amounts with savory herbs for fragrant stews. Household - Put dried flowers in sachets and bundles to scent drawers and to protect linen from moths. Rub fresh flowers on skin or pin on clothes, to discourage flies. Stem use dried as incense or scented firelighters. Cosmetic - Make tonic water for delicate and sensitive skins to speed cell replacement and for an antiseptic against acne, add to soap. Use oil in message for muscular aches, fluid retention and cellulite. Add to your scrub water for regular cleaning jobs from floors to counters to bathrooms. Medicinal - Infuse as a tea to soothe headaches, calm nerves, and ease flatulence, fainting, dizziness and halitosis. Use heated essential oil as an antiseptic, mild sedative and painkiller, particularly on insect bites, stings and small (cooled) burns. Add six drops to bathwater to calm irritable children, and place one drop on the temple for headache relief. Blend for use as an aromatherapeutic massage oil in for throat infections, skin sores, inflammation, rheumatic aches, anxiety, insomnia and depression. Caution: When using lavender use common sense ... remember, a little bit goes a long way.